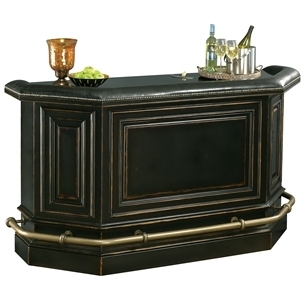 This raised panel bar is finished in Burnished Black on select hardwoods and veneers, and features a worn look. Includes a black faux leather armrest, accentuated with antique brass nailheads. Includes a one-piece sparkle, black granite top and an antique brass-finished metal footrest. The framed panel detail continues to the backside door and drawer moldings. The one piece granite top is removable for easier installation. Two swing-out drawers on each side for storage; one includes a sparkle black granite cutting board and the other a black laminate prep shelf. A quarter-round lazy Susan with two fixed shelves for liquor storage. Four pull-out wine storage drawers that hold up to a total of sixteen bottles of wine. Locking doors to keep your wine and spirits secure.